Day 136 – Warren S.
Last Thursday I was still pretty sick from the stomach virus I came down with on Wednesday. 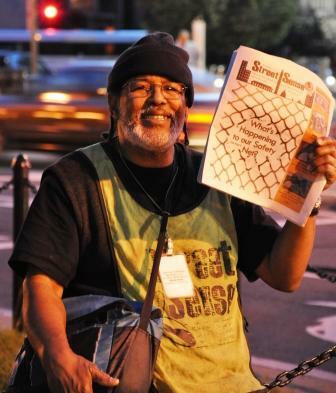 I finally got myself out of bed around 8pm and walked up to Dupont Circle and found Warren, a two-year veteran of the Street Sense sales force, resting on a chained fence hawking newspapers. Born and raised in Washington, DC, Warren has spent most of his time in the nation’s capital, however, he did spend about 5 years in Japan as a youth. He now spends his afternoons most days selling the Street Sense, usually in and around Dupont Circle. It helps support him, but he confides that he would love to have a job that paid a little more. He used to work in the office printing business as well as drive a delivery van and hopes to be able to return to similar more stable work. When the weather is bad now, he barely scrapes by due to low paper sales. If you know of any potential jobs for Warren, please let me know. Warren was kind enough to let me videotape him briefly. Take a look. Warren said he was going to use my $10 to help buy him some groceries. If you have not already signed up for the Worldwide Day of Giving on Facebook, please do so now! June 15th is less than 45 days away! on May 4, 2010 at 3:42 pm | Reply Debbie F.
I can’t explain to you what this blog, your journey through this year giving, does to me. To see these people, to hear their stories, it makes me cry. I’m not sure you will ever fully comprehend the magnitude of what you are doing, but it is huge! God bless you! It is such a strange world we live in. I, and I suspect many others, would like to see a story next year about most of these people. It might be interesting to see how you made a difference by speaking with them and giving them the $10.00.